If you’re the kind of person who’s terribly afraid of the impending robot revolution as well as someone who struggles when it comes to putting together IKEA furniture, we’ve got some good news for you: robots are also pretty bad at it, so maybe that’ll delay the artificial intelligence uprising somewhat. Researchers at Nanyang Technological University in Singapore (h/t Gizmodo) wanted to see what a robot could do when facing messy situations –like when you accidentally empty all the parts you need to build furniture onto the floor — so they set it up to construct an IKEA chair… or rather, they gave it a chance to try to put together the chair. 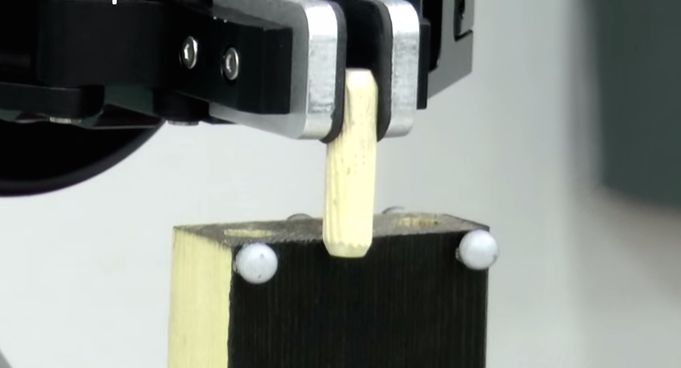 A robot was equipped with two grippers and force sensors to measure grip strengths, and set in front of six cameras so researchers could watch from every angle as it tried to stick a wooden dowel in a hole in one of the chair’s pieces. It’s a common task that even the most inept IKEA customers have managed, but it proved a bit tricky for the robot. The thing is, robots are pretty good when they’ve got a simple, straightforward task in front of them, like putting together the parts of a car on an assembly line. But when faced with the complicated task of hunting around for pieces, holding one part still while locating the right spot to stick another piece into it, the robot has a bit of a tough time before it finally finds its mark. Basically the robot has to try and try again, after failing to succeed the first time (I think I read that quote on Facebook somewhere, Mark Twain, right?). Can it build a whole chair? Not yet, but don’t be surprised if it figures things out eventually — who else is going to build all those thrones for our robot overlords?